Yeah, I know, another post about the California drought, yada yada. 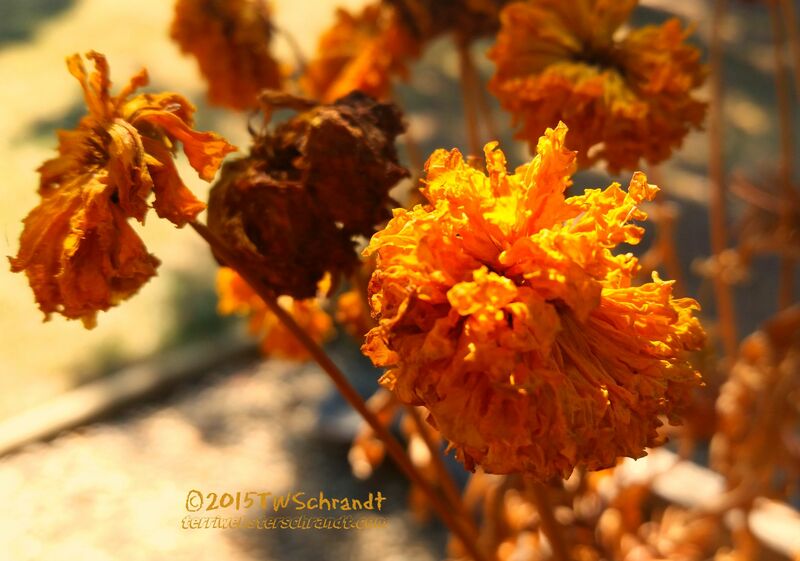 But, appropriately, drought is the subject of this week’s One Word Photo Challenge hosted by the talented Jennifer Nichole Wells. My poor marigolds didn’t quite make it. I even replanted their seeds, but no. Too hot, too dry. Here is our official watering schedule. I can water my lawn two days a week for 15 minutes. Yippee! I am still using the water saving tips I posted in June. There are weather predictions about a winter El Nino weather system that promises record-breaking rainfall. The key to the winter storms, though, is a large snowpack in the California mountains. A deep snowpack is key to full reservoirs and the survival of the California economy and agriculture. I am looking forward to unpacking my wellies and raincoat. Keeping my fingers crossed. Poor marigolds:( They’re proof of the drought that’s been plaguing your area:( Here’s hoping the snows/rains will arrive safely and soon! When there is mositureat the right those seed may spourt.. I tried to replant and kept watering, it was just too hot. Did you know that seeds from the Egyptian tombs have sprout? Sorry about those marigolds. I do a lot to not waste water, because I hate to do water. Mulching, only watering the plants, using household water, is great, as long as you have the water. The pictures of the almond trees of So.Cal. were really sad. Like you said, a tree is harder to replace. Hopefully El Niño isn’t a shy little boy. We need him to show his strength and bring us lots of rain and snow. Just make sure the roof over your addition is finished in time. No kidding! He better be an mature, grumpy man, LOL! The roof is getting close. I’ll probably be posting some pics soon. Moving out of my bedroom …ugh. Let us know. I’m sure some rain would be much appreciated! I thought you might have something interesting to share this week 😉 Love your gorgeous marigolds – they may be dried up but you captures them wonderfully!